Newbury, 18th January 2018 – Not-for-profit, The Good Exchange, has provided key support to Ark Cancer Centre Charity’s mission to raise £5million to help build a state-of-the-art cancer treatment centre. 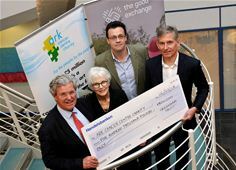 (From left to right) Ark Cancer Centre Charity trustees Merv Rees and Sandra Fell are presented with the £500,000 match-funding cheque by Ed Gairdner, chief operating officer of The Good Exchange, and Chris Boulton, chief executive officer of Greenham Trust. Largely being funded by Hampshire Hospitals NHS Foundation Trust (HHFT), the new centre will improve and enhance the cancer patient’s journey, providing chemotherapy, radiotherapy, complementary treatments and supportive services in a calm and uplifting environment. The majority of HHFT cancer patients currently have to travel to Southampton or Guildford to receive radiotherapy, but the new centre – which will probably be built on the existing Basingstoke hospital site – will bring this treatment closer to home for more people. By providing radiotherapy and other services under one roof, the centre will be a beacon facility. The offer of £500,000 of match-funding from Greenham Trust, through The Good Exchange, has been a significant factor in Ark’s fundraising campaign to date as many fundraisers and donors have raised or given money, knowing Greenham will double the contribution. Just before Christmas, Ark hit the £500,000 match-funding target – and now Chris Boulton, Chief Executive Officer of Greenham Trust and Ed Gairdner, Chief Operating Officer of The Good Exchange, have handed over the match funding cheque to Ark Cancer Centre Charity trustee Merv Rees. Leading liver cancer consultant surgeon Merv said: “We are grateful for every donation that the charity receives, but the fact that people have been able to double the value of whatever they raise or donate has been a great incentive for people to use The Good Exchange. “There is no doubt that The Good Exchange has done a power of good to Ark Cancer Centre Charity’s campaign to raise the £5m of funding that will be crucial to delivering the cancer treatment centre that local cancer patients and their families need and deserve. Ark Cancer Centre Charity is continuing to encourage fundraisers and donors to give money through The Good Exchange, and the charity is currently looking for new funders to follow in Greenham Trust’s footsteps by providing future match-funding support. Ed Gairdner, chief operating officer of The Good Exchange, said: “By using the match-funding capability offered through The Good Exchange online platform, Ark Cancer Centre Charity and Greenham Trust have been able to optimise the way that money is being raised for this huge scheme. Chris Boulton, chief executive officer of Greenham Trust, said “We’re thrilled that this milestone has been reached and that we are now able to hand over £500,000 to Ark Cancer Centre Charity, helping it to move closer to the goal of opening a local cancer treatment centre.